You may have read news about young and healthy athletes having their lives cut short by sudden cardiac death when they competed in their pet events. Thaddeus Cheong, a triathlete, died during a selection trial for the SEA games. Some of us who happen to be relatives and friends of these unfortunate few will mourn their passing, but in order not to let their deaths to be in vain, we can definitely draw important lessons especially on how to deal with the potential emergency of a relative, neighbor, friend or stranger collapsing when their heart stop beating so as to increase their chances of survival. Obesity, increased body weight, high blood pressure, mental stress and old age places a patient at risk of suffering from sudden cardiac death. Whilst there have been reports in recent years on younger Singaporeans dying from sudden cardiac death, the fact remains that most of such deaths (two third) occur amongst Singaporeans over the age group of 60. Less than 3% of the deaths occurred for the age group below 35 years. For the record, an average of 16,000 deaths occur every year and 23% can be attributed to cardiac causes, and one-third of these are due to sudden cardiac death. In a preventive measure implemented by the Singpore Armed Forces, pre-enlistees are required to undergo an electrocardiogram screening to identify anomalies associated with the heart. Such preventive measures represent the first-line of defense which allows us to screen out susceptible individuals. However, there are some who may slip past the cracks, and the next line of defense is to have established emergency response procedures in place. Thus, what would be the appropriate reaction in the face of such an emergency? Anyone familiar with first aid will be aware of the concept of the chain of survival which involves four steps – early access to emergency services (ambulance), early cardiopulmonary resuscitation (CPR), early defibrillation and finally, early advanced care (which takes place in the hospitals or medical centres). In the event of such emergency, when it has been established that the casualty is unconscious and is therefore, unresponsive, the emergency services has to be activated. However, the ambulance will arrive on average 10 to 15 minutes upon activation. The problem is that when the heart stops beating, oxygen supply to the brain is stopped. If no help is administered, the brain will start to die from the lack of oxygen after four minutes. Failure to administer help during this period will lessen the casualty’s chances of survival and increases his/her chances of death. Hence, it is important to administer first aid, which brings us to the next step – applying CPR. The Singapore Medical Association and the Singapore Heart Foundation have both launched a mobile CPR download for handphones. This will guide CPR and non-CPR trained personnels through the proper steps of CPR. It is currently available to Starhub subscribers. The third step is early defibrillation which involves the use of devices that will deliver a therapeutic dose of electrical energy to enable a stopped heart to resume beating. A video showing the application of CPR and AED to a victim who suddenly collapsed. Early defibrillation can be considered the most important and significant step within the chain of survival. It has been documented that early defibrillation increases the chances of survival at between 15% to 40%. For every minute that passes without defibrillation, the chances of survival decreases by 7% to 10%. Thus, what needs to be done is to improve access to automated external defibrillators (AED), which are devices capable of administering defibrillation. AEDs are designed to be simple for use by a layman. 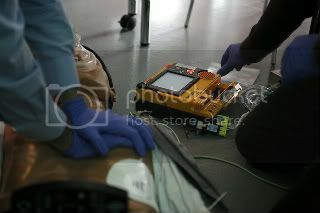 The device is able to examine the casualty’s heart condition, and provide instructions to the rescuers to follow. AEDs are currently available in hotels, shopping centres and schools in Singapore (information from the Singapore Heart Foundation’s consolidated list). However, there is definitely more room for improvement with regards to widening access to AEDs. According to the Singapore Heart Foundation website which maintains a registry of locations that have installed AEDs, such devices are currently found in sports, entertainment and commercial establishments. There is a crucial need to extend access to AEDs within our residential areas, where sudden cardiac arrest (that may lead to sudden cardiac death) can strike, especially among our senior citizens who are likely to remain at home most of the time. In HDB flats and condominiums, it will be ideal to have an AED for every two storeys, or even better, every storey. As for private residential areas, an AED should be available within a 100 metres radius. There should be an AED in every military installation or camp where strenuous activities may take place. And if there is an exercise outside the premises of the camp that involves physical activities, an AED should be brought along to the exercise area. Upgrades to residential areas is an issue that is recently discussed in parliament, but most of the time, it is concerned with the addition of amenities such as sheltered walkways and multi-storey lifts that will make our residents’ lives more convenient. During such debates, it is very easy to overlook the possibility of adding a particular heart-friendly upgrade that can save sufferers whose hearts have stopped beating from the jaws of death. Isn’t it about time we install AEDs in our residential areas in a bid to implement a HEART-friendly upgrade for our HEARTlands? Ditto for our military establishments. If there was an AED within the vicinity 2WO Teh’s and 3SG Ong’s collapse that allows the administration of electric shocks to stimulate their heart to start pumping, both could have better odds of surviving.